Unsurprisingly, President Trump is stewing and angry about the Mueller Report. This report from CNN notes that Trump is angry about the picture of a lying President and chaotic White House. But what really gets to him apparently is the image of a President whose staff routinely ignores his orders. If you’re an Inside member and you missed yesterday’s briefing and Q&A on the Mueller Report with me and Allegra Kirkland, the recording is now online in your account portal on the upper right. I think it’s safe to assume that from the get go Mueller had no intention of indicting Trump because of the DOJ policy. Then he comes out and says, from what I can tell without reading the full report on my own, that there wasn’t enough evidence to charge him with a crime. What’s up with that? He never saw his job as indicting and prosecuting Trump, so why come a conclusion regarding criminality? So one big finding so far, following up on David’s note below. It’s in the “Introduction to Volume II”, the obstruction part. It’s very specific and detailed. But it’s only two pages. You can read it yourself. It’s pages 213-14 in the PDF, pages 1 and 2 of that volume of the report. The gist though is that the Special Counsel decided not only that they couldn’t indict a sitting President but that it would not be fair even to accuse him of a crime without indicting him. They also say that if they decided he shouldn’t face prosecution (under the normal standards that would apply to a non-President) that they would say so. They did not. The gist is that the whole non-finding of obstruction seems to rest on the DOJ/OLC belief that a sitting President cannot be indicted – quite contrary to Barr’s claim. We’ve broken out both introductions here. The bizarre Barr defense of Trump on obstruction (he was frustrated) echoes the defense used (unsuccessfully) in the obstruction case against former LA Sheriff Lee Baca. Worth checking out. Interesting parallels. Unfortunately for Baca, he didn’t get to choose his prosecutor. We’re maybe 6 or 7 minutes into Bill Barr’s extended summary of the Mueller Report. And it’s basically an extended version of the Barr Letter, Barr making maximal ‘no collusion’ claims. Same highly technical language. So many side stories and rivulets to watch over the course of the day. But I note that The Washington Post already seems to be downplaying its scoop that the Report would only be “lightly redacted”. It’s still included in the current versions of their main story. But it appears to have been demoted from the headline and nowhere on the digital front page. Curious to see how that get from Barr’s aides will age over the course of the day. 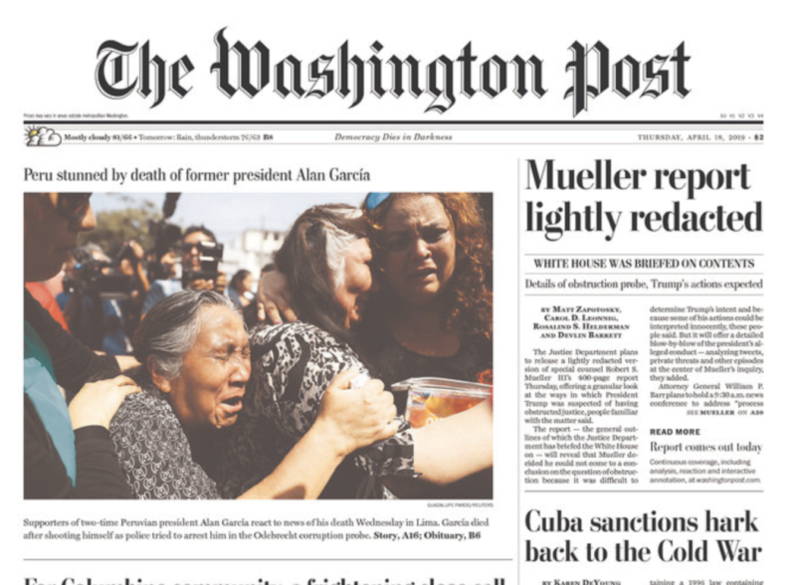 The Post especially seems to have leaned quite far out on the basis of news that almost certainly comes from Barr and his top aides.